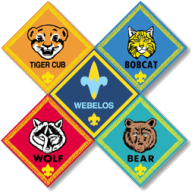 I hope everyone is getting ready to Race into Scouting with Cub Pack 94’s 2015 Blue & Gold Banquet. Unlike prior years, this year is a luncheon. However, like previous years, we will be having a potluck. Webelos Side Dishes. This can include things like baked beans, mac & cheese, pierogis, etc. I will be supplying the burgers & rolls, and the Pack is supplying the cake and make your own sundae fixings. In addition, I am looking for 5 or 6 volunteers to assist in the kitchen, helping serve and coordinate the food. If you have any questions or concerns, please let me know. My email is committeechair@cattypack94.org. Hope to see you at the 2015 Blue & Gold Banquet!